New free course for journal editors! Scholastica, American Journal Experts, and Research Square announce the release of a free training course for journal editors on best practices for managing authors throughout peer review and production. Sign up here! Managing authors is one of the most important duties of academic journal editors. Author management begins from the time an author comes to your journal website to determine if and how to submit a paper, and extends all the way through article production, should the submission be accepted. Editors must provide authors with the information they need to send a proper submission and make revisions, and manage authors’ needs and expectations throughout the review and publishing process. How well your journal manages authors will have a direct impact on the submissions it receives. By turning off just one author due to a poor submission experience, your journal could potentially miss out on dozens of manuscripts from that author over the course of his or her career, as well as submissions from colleagues to whom he or she may have recommended your publication. For these reasons, it’s imperative that journals focus on developing and iterating on author management processes. 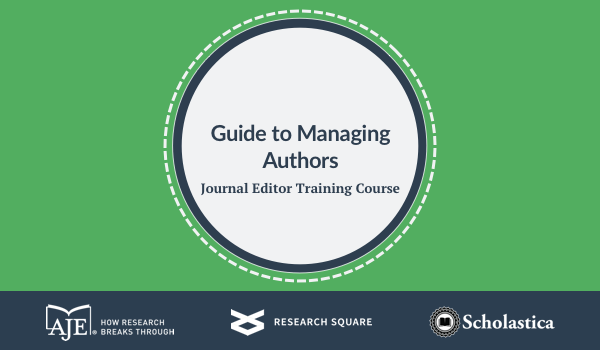 Scholastica, American Journal Experts, and Research Square have brought together our collective experience working with hundreds of journals and thousands of authors to produce a free course to help journals better support authors - The Guide to Author Management. Effective author management requires having clear author documentation - from submission guidelines to ethical policies - as well as plans and procedures in place for dealing with common author queries and peer review and publishing scenarios. Each course section will equip you and your editorial team with essential information to develop necessary author management processes, or build upon your current policies to make them even better. You can use these worksheet templates as is or modify them as needed to better fit your journal’s unique workflows and policies. With the growing number of scholarly journals, authors have more publication options to choose from than ever before. They also have more submission guidelines and publication policies to parse through, which can make choosing where to submit their manuscripts and adhering to journal guidelines tricky at times. Your editorial team can increase the likelihood of authors submitting to your journal and give them a superior submission experience by providing clear information about your journal aims, scope, and policies at the time of submission and throughout peer review. By providing submitting authors with clear information upfront, you’ll give them the best submission experience possible and increase the likelihood of those authors sending future manuscripts to your journal and recommending it to colleagues. Higher quality manuscripts: By clearly communicating your journal submission guidelines, you’ll set yourself up to receive manuscripts that are higher in quality. Faster peer review: By proactively guiding authors, you can answer common questions up front and cut down on back-and-forth emails for faster peer review. Better revision experience for authors: The revise and resubmit process can be one of the most stressful times for authors. You can alleviate much of authors’ anxiety and avoid confusion during the revision process by giving them clear guidelines and next steps. While it takes time to create and revise author management processes and documentation, we promise it’s worth it. By fixing just a few simple author management mistakes you could drastically improve peer review at your journal and consequently attract more quality submissions. Ready to take the Guide to Managing Authors training course? You can sign up here! Are you interested in other courses like this one? Scholastica is working on launching a series of editor training courses. This and our Guide to Managing Reviewers are the first two available. If you have ideas for a course that you’d find useful let us know!